This schematic covers the complete Rainbow R1024 power nozzle assembly that includes the motor, brush roll, and pivot arm. Original factory OEM chrome sole plate for the R1024 model power nozzle. This sole plate item number fits versions E through H.
Original OEM factory bearing for the brush roll assembly on the R1024 power nozzle. Vibration or squealing noises could be coming from this part. The early version bearings were plastic. This revised metal version holds up better to heat. This part should operate at around 130 degrees fahrenheit. Brush roll seal for the R1024 D through H version power nozzle. This item can sometimes get damaged and burned when the end bearings start to heat up and fail. This insert crimps onto the screw boss studs that attach the sole plate to the main housing. Fits all R1024 power nozzles version A through H.
This item is used in two locations on the R1024. Standard sole plate screw for theR1024 power nozzles version E-H. The A-D versions have a snap on sole plate. Motor mount screw that comes from the top of main housing under the decal. 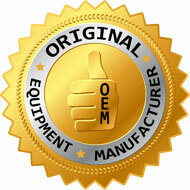 Original OEM factory motor for the R-1650A, and R1024 model power nozzles. Has the mounting locations on bottom of motor housing to allow screws to mount to power nozzle housing. This motor has several model or part numbers assigned to it... 118154-54 for example. This current motor is a direct factory replacement for all previous models. Factory OEM belt for your R1024 series power nozzle. This belt is slightly different than the R1699 belt that works on most other model power nozzles. Previous markings on some versions may show 2450, 6185. Distribulator / brush roll assembly for the R1024A, R1024B, R1024C, and R1024D power nozzle. This brush roll does not have a metal keeper or felt seal pressed into the wood on the end under the bearing. *NOTE - The "D" version did have a metal keeper and felt seal but is no longer available. This brush roll is a direct replacement and has the correct size pulley for that version. This smaller pulley is needed to fit the original sole plate that does not have a relief stamped to accept the larger pulley. The larger 15/8 pulley was introduced on the "E" version and allowed for more torque from the motor. Complete factory OEM brush roll assembly for the R1024 power nozzle version E through H. Make sure you confirm what version R1024 you have. This brush roll has the metal keeper and felt seal. The brush roll for the A and B versions do not. If you have the original "E" version, you will see that the end pulley is on a completely threaded shaft. This design has been discontinued and the current design is a direct OEM replacement. If you have a "D" version of the R1024, you will need to purchase an R1368 brush roll as it comes with the smaller diameter pulley that is needed to work with the non-relief sole plate than was standard equipment on this version. Long beater bar for the R1024 brush roll assembly. Exact size is 5 55/64, 148.73 mm, or 5.85 inches. Replace one at a time to ensure correct install as you can install backwards. Will fit all versions of the R1024 family. Short beater bar for the R1024 brush roll assembly. Exact size is 4 35/64, 115.46 mm, or 4.54 inches. Replace one at a time to ensure correct install as you can install backwards. Will fit all versions of the R1024 family. This brush roll assembly washer fits the R1024 power nozzle. Helps to shim the gap in between the bearing assembly and brush roll assembly. Aluminum pulley that came standard on the R-2800C, R-1650C, and R-1650A power nozzle. Also works with the R1368 brush roll assembly for the R1024 version A through D.
Standard factory OEM brush roll assembly pulley for the R1024 power nozzle version E through H.
Small lock nut that holds the pulley in place on the brush roll assembly that fits the R1024 power nozzle version E through H.
Original OEM factory main housing for the "E" version R1024 power nozzle.